The arrival of the Easter week-end means the racing season has slipped into high gear. It also signals the start of a hectic time for us at Boss Racing. This week-end we were in Norfolk and Hampshire for two very different forms of motor racing. On Saturday we were supporting Caterham Seven racer Peter Hargroves. Hampshire-based Peter owns a string of cycle shops as well running a very successful cyclo-cross team, all of which keeps him very busy. But when he wants a taste of something a little quicker he runs a 2-litre Duratec-powered Caterham. He’s also having a BMW built so he can compete in a tin top championship. We’re looking forward to maintaining it for him. Peter runs the Caterham himself and we look after maintenance. For the start of the season we changed the diff ratio in its final drive together with LSD loadings. We also overhauled the steering rack and, using our four-wheel alignment equipment, set it all up to optimise the diff and steering work. Finally, we fitted some aero parts, a race half-door and tonneau. Both were painted to a high standard in gloss black. 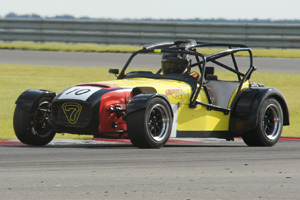 At Snetterton Peter had entered his Caterham for a couple of all-comers’ events. The first featured an 18-car grid. Talk about a mixed bag: seven Caterhams, a two BMWs and a couple of Crossle sports cars plus single examples of Jade, Nemesis, Westfield, Atom, Lotus Elise, Toyota MR2 and MGF VVS. Not unexpectedly Martin James put his Atom on pole. Peter wasn’t able to get a really good qualifying run and started 12th and fourth fastest Caterham. As it happened, there were two starts for the first race as Merrick Linnett (also in a Boss-prepared Caterham) hit the pit straight wall. Malcolm Shaw was also having problems with his BMW and both failed to make the second start. Tom Eden in his new Caterham CSR took the chequered flag with James second in the Atom and John Gray third in the Jade. After 15 minutes of racing on a drying track Peter came home sixth and third in the “Caterham Class.” After a good start he was eighth on the first lap, having made up several places. On lap seven he passed Mark Drain’s Caterham and a lap later, Stephen Pearson’s BMW. By the time the second race started the track was drying. Peter made up two places from the start to finish fourth just behind Richard Green’s Caterham. James was the winner with Gray runner-up. On Sunday another of our runners, Slade Green-based stockbroker and 2 litre hot rod driver Mark Crome, was busy at Aldershot. This is one of the hot rod classes I used to race in and I still have a passion for it. I love the cars, which have a space-frame chassis. Bodywork is a mix of steel panels from a two-door hatchback – Corsas, Novas, Fiestas and Saxos are typical – with doors, boot lids, bonnets and bumpers of Kevlar. The cars have rear-wheel drive with power from a 2-litre Ford Pinto engine mated to a three-speed gearbox. Circuits are usually quarter-mile Tarmac ovals and although most feature Armco crash barriers, wood and wire fencing is not uncommon. 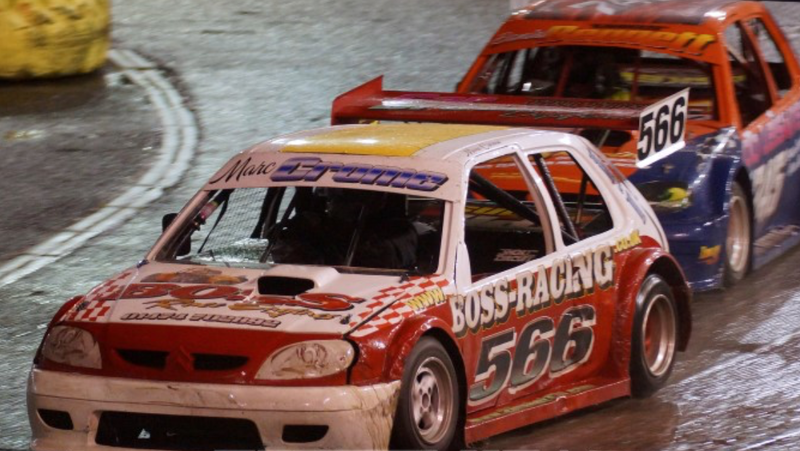 Race format comprises two 15-lap heats with results decided by a 30-lap final. Grids of up to 38 cars are not unknown but the norm is 20 to 25. At the wheel of his Saxo look-alike with Boss Racing-prepared engine Mark had quite a good day. He was third in his first heat and won the second but he failed to finish the final. I still can’t get over our amazing four-wheel alignment equipment. We used it on both Peter’s and Mark’s cars. Operating on such different cars certainly keeps us on our toes and our intention now is to try some different set-up disciplines. Meanwhile, we’ll be racing again next week-end so there’ll be a lot more to report. It’s all happening now!